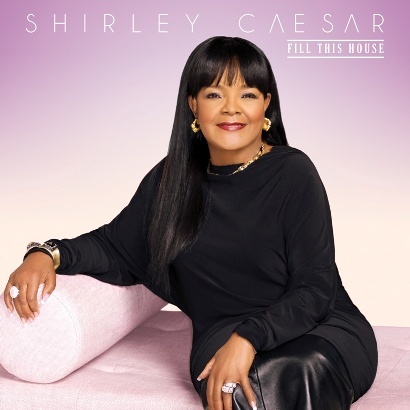 Shirley Caesar | Fill This House - TheUrbanMusicScene.com | Music Reviews! When one has traveled the long hard road towards an effective music and pulpit ministry, there needs to be the accompanying tribulations behind the scenes so they can share their testimonies to their audiences. Celebrating fifty years in focusing her singing talents solely for the Lord, Shirley Caesar has sang many a song on top of preaching many a sermon while battling and praying through the personal spiritual wars. Though her solo career began in 1966, GMA Hall of Fame inductee Caesar already was a seasoned gospel performer including her long tenure with The Caravans, led by another GMA Hall of Fame inductee, Albertina Walker. If you exclude all the deserved accolades of Grammys, Stellar & Dove Awards, Caesar simply walked the spiritual talk for every which generation she addressed. In a career that has entailed acting, singing and co-pastoring at a church in her home state of North Carolina, Caesar continued representing the Lord’s work as an ambassador by encouraging those to seek the Lord, capped by the powerful hit “No Charge” which crossed over to the R&B and pop charts in 1975. With over forty recorded projects to her name, the FIrst Lady of Gospel still possesses a bundle of enthusiastic energy that translates the joy of the Lord personified on her latest entry, Fill This House (Light Records/E-One). Anchored by sweet Southern soul and the passionate tenor of Anthony Hamilton, the riveting first single, “It’s Alright, It’s OK,” encourages those that through dark times, joy comes in the morning. “Survive This” centers around a passionate exchange between Caesar and Hezekiah Walker with a reminder that there should be no pity party when it comes to life’s obstacles. As a soloist, Caesar’s commanding voice holds all the attention despite the faintly ordinary, contemporary shaded title track, “Need Him Now.” However, “Be Happy (I Command U To Live)” ends up being too stilted, even for Caesar’s ministry confidence to overcome. Yet despite a couple of minor blips, Fill This House is still filled with musical excellence. Gospel blues fueled by call and response rules the day as proven with “He Won’t Fail You.” “Mother Emanuel” teaches a much valuable lesson about finding forgiveness in an excruciating situation of a recent shooting in a South Carolina church, affectingly conveyed by Caesar. Taking it back to old school worship, the veteran pastor navigates her preaching moments on the rarely heard hymn, “Sow Righteous Seeds.” In an interesting turn, this is followed by the gentle reggae-tinged original of the same name, even though the message of reaping what you sow remains the same. Another spiritually thought-provoking piece, “Prayer Changes Things” is a pulsating plea to take prayer seriously and that it can favorable change situations. Gathering all those teaching and praising moments together in the hands of a veteran gospel messenger, Fill This House represents Caesar’s 50th Anniversary gift in pleasing style. Four and a quarter stars out of five.